How do I manually create a course? Courses can be created in one of two ways. The first, using the SIS Import tool will likely be used wIth a large institution. The second is manually. Manually created courses are not linked back to any SIS data (though they could be) and are not affected by SIS imports. Click the Add a New Course button. Type the course name in the course name field. Type the reference code, also known as the Short Name or Course Code (what will be displayed at the top of the course navigation) in the reference code field. 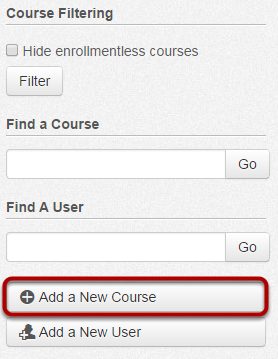 Select which sub-account to add the course to by selecting the department drop down menu. 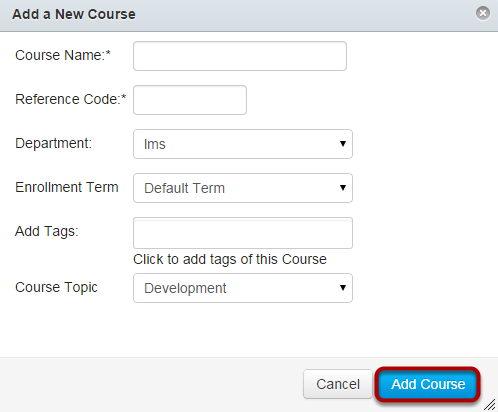 Select the enrollment term drop down menu to assign the course to a Term. Remember the Term gives the course a set of access dates for Students, Teachers, and TA's. Click the Add Course button to create the course.